Shown from left: St. Francis de Sales School Principal Maryrose Hall, Travis Gaskill, Connelly Foundation representatives Emily Riley and Oonie Lynch, and St. Francis de Sales Parish’s Pastor, Father Alan Okon. 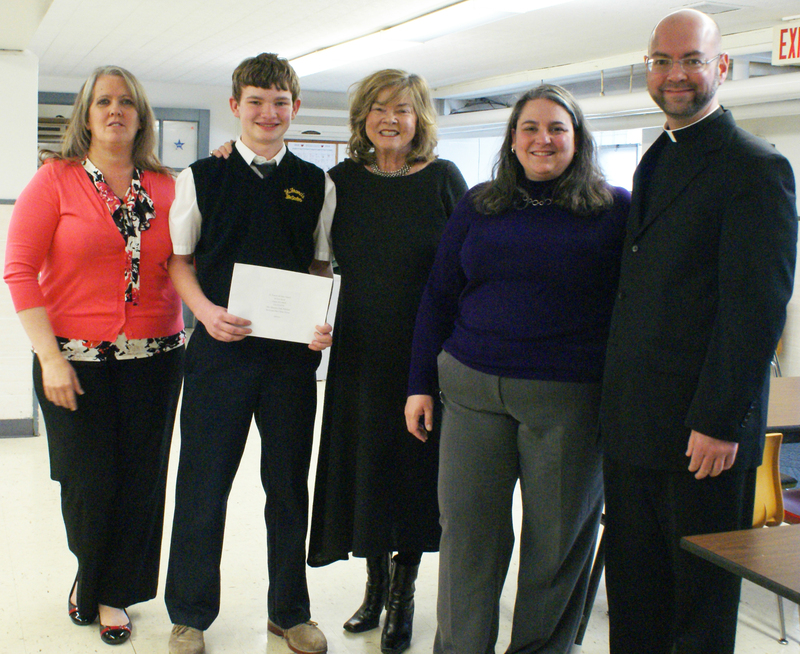 Travis Gaskill, an eighth grader at St. Francis de Sales School in Aston, Delaware County, has been accepted into the Neumann Scholars program. He is one of 37 scholarship recipients in the Archdiocese of Philadelphia this year. See other recipients here. The Neumann Scholars program, sponsored by the Connelly Foundation, awards academically talented eighth grade students through an independently administered competitive examination and provides four-year scholarships to attend one of 17 archdiocesan high schools. Both Travis and his brother Trevor, a fourth grader, have been students at St. Francis de Sales since first grade. Travis will be attending Cardinal O’Hara High School in the fall. He has also qualified for the 2013-2014 Global Talent Search sponsored by the Johns Hopkins University Center for Talented Youth. He is an elected member of student government, plays baseball and basketball for CYO, and is an altar server. Travis is also a Boy Scout with Troop 225 chartered to St. Joseph Parish in Aston.